An ultra-rare Aston Martin dating from the Second World War is set to fetch hundreds of thousands of pounds when it is auctioned at the Goodwood Festival of Speed in June. The lightweight, aerodynamic 75-year-old Aston Martin Atom is one of the world's oldest concept cars. Finished and registered in 1940 just six weeks after the Dunkirk evacuation, it was designed and built for businessman Gordon Sutherland by a team headed by engineer Claude Hill. 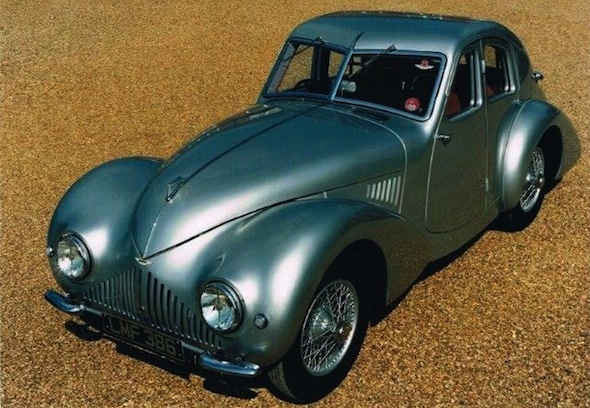 Because of the wartime need for metal, it was among fewer than 750 private cars registered in the UK that year, with Sutherland saying: "The whole point of the Atom was to make the smallest, lightest, enclosed saloon possible." The name was chosen as an atom was the smallest, most powerful thing conceivable – the essence of everything. The 2-plus-2 prototype coupe, which wowed the wartime press and stunned people with its speeds of 90 to 100 mph, had to be stored for up to three months at a time during the war because of a lack of fuel, but its technological developments proved invaluable when Aston Martin began production again after the war. The Atom has done some 250,000 miles and changed ownership just once in the past 49 years. Painstakingly conserved and maintained by its current owner, it will be offered for sale by Bonhams at the Festival of Speed on June 27. James Knight, group motoring director at the auction house, said the Atom was "plainly one of Aston Martin's absolute landmark designs, and certainly one of the most exciting one-off British cars we have ever been asked to offer." He added: "It is unique, it is super-sophisticated, and when one considers it within the context of 1939-40 it represents a monumental achievement. That the Atom has survived in almost constant use, and is today so beautifully conserved in highly original order, is a great tribute to the enthusiasm and taste of the Aston Martin connoisseurs who have fostered it for so many years. "Our initial thoughts are that it will realise many hundreds of thousands and it certainly has the potential to achieve more."